JB Holmes leads the Genesis Open by one shot from fellow American Jordan Spieth after the first round was completed on Friday following Thursday's heavy rain. 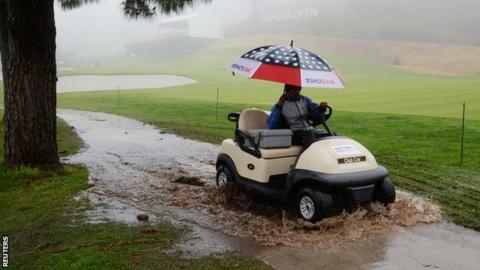 Long delays meant the majority of the field did not begin their opening round until Friday at Riviera Country Club. Organisers even took the unusual step of nullifying the scores of those who had headed out in awful conditions and allowing them to re-start the round. Holmes carded an eight-under-par 63 to take the lead in Los Angeles. Spieth said he was "fortunate" to be able to start his round again after initially heading out in increasing rain and deteriorating visibility, going on to birdie the three par-fives and also chip in twice for birdie. The American said he returned to play "beautifully" on the final six holes on Friday. "Yesterday was a grind to start," he added. "Was really fortunate to kind of have my short game on point, chip a couple in. "Those were bonuses that very well could have been bogeys." Americans Justin Thomas and Tony Finau and Australia's Adam Scott were among a group of six players to finish on five under. Phil Mickelson saw his unlikely par at Riviera's 10th - where he was in three bunkers and holed out from the sand - written off as play was restarted on Thursday, eventually finishing on one over on Friday. Fourteen-time major champion Tiger Woods carded a one-under-par 70, along with Englishmen Tyrrell Hatton, Paul Casey and Tommy Fleetwood, with Northern Ireland's Rory McIlroy two shots adrift. The second round immediately followed on while some players were still out completing their first on Friday. Do you remember old PFA teams of the year? Analysis and opinion from the BBC's golf correspondent. Get the latest golf headlines sent straight to your phone, sign-up to our newsletter and learn where to find us on online. From hitting a few balls on the range or a quick nine holes, to the full 18 and tournaments - how to get into golf.